By L. Joe Porter, M.D. It can be easier than you think! It’s the little things that make the difference. What you eat or don’t eat…whether your ride or walk…or whether you fret or learn to relax…all affect your overall well-being. Joe Porter, M.D. knows the value of making changes. After overcoming an illness, he got serious about making simple, but significant, lifestyle changes. The result: he felt better physically, emotionally, and spiritually. 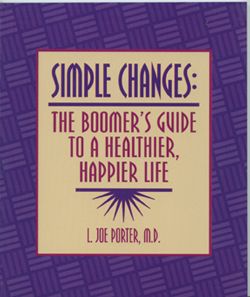 Now, Dr. Porter shares his tips for a healthier life, countering common opinions with medical facts. Whether you want to lose weight or improve your mindset, Dr. Porter offers ways to make changes—simply, but powerfully. Make the Change! If Not Now…When?